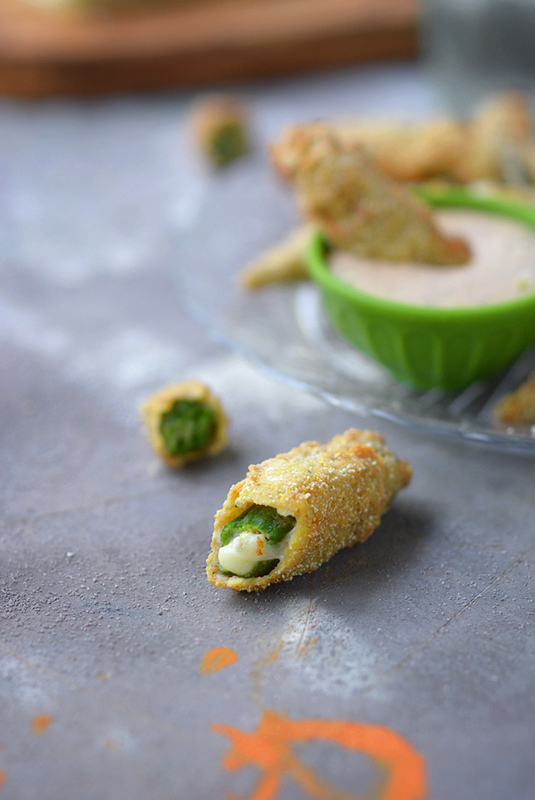 Fried Okra Stuffed with Pepper Jack Cheese – Kick up your next party with this spicy, late summer treat that’s gushing with delicious cajun flavor. Okra can be a fantastic late summer or early fall addition to your menu. They almost “pop” in your mouth and their star-shaped appearance is certainly pretty to look at. That being said, okra can also go horribly, horribly wrong. If you’ve had okra before you might know what I’m talking about. That SLIME. 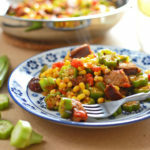 Fortunately, slimeless okra recipes do exist in the real world. Before I go on unfairly disparaging okra slime, I just want to point out that there is nothing wrong with consuming it. It’s actually quite healthy for you and aids the body in digestion, similar to the slime produced by chia seeds. Even still, some folks prefer their okra less slimy. Soak it in vinegar for half an hour before cooking. I tend to refrain from doing this as it can affect the flavor. But you may have heard of pickled okra. It’s quite good! Cook it fast at a high temperature. This can be done by blanching, roasting, sautéing, and deep frying. You can do this and then serve your okra as-is. 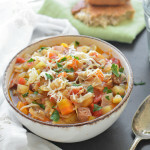 You can also pre-cook it at a high temperature before adding it to a dish. 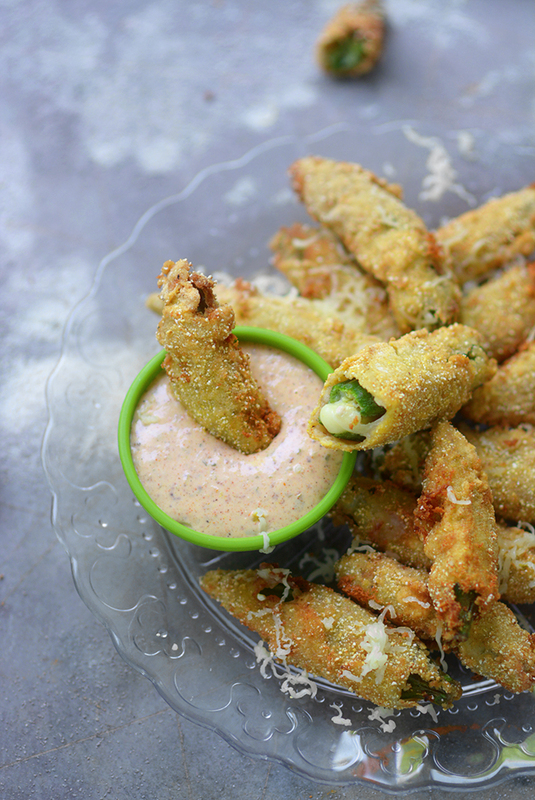 My recipe for Fried Okra with Pepper Jack Cheese uses the latter trick. 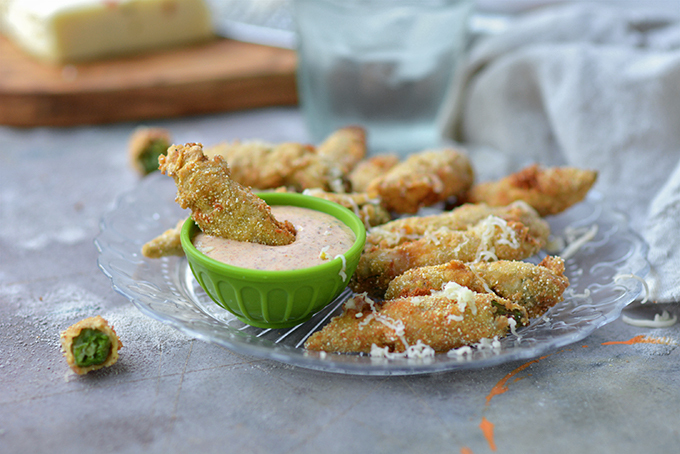 Honestly, you’ll be eating these little poppers and you’ll be like, “Wait a second, am I really eating okra?” They have a deliciously crunchy breading. When you bite into the okra there’s that signature “pop” and then you get a savory gush of pepper jack cheese! The only trick, it would seem, to enjoying this tasty appetizer is getting the cheese into the okra. Okra is actually perfect for stuffing. Some of the seedy center can easily be scooped out to make room for cheese. Additionally, the sturdy okra pod holds up well with frying. Wash the okra and dry it with a towel. Trim the tips of the stems so that they look pretty but don’t cut off the stems completely. Cut a slit along the length of the okra pieces from the base of the stems to about 1/4 inch from the end of the fruit. Next scoop out most of the seeds with a small spoon to create a space for the pepper jack cheese. A 1/8 teaspoon works well for this task. Once all of the okra is prepped, cut the cheese into large matchsticks. Stuff them into each piece of okra until the pod feels stuffed and firm but isn’t overflowing. For a number of years I was a little intimidated by deep frying in my kitchen. The hot oil and the risk of burning myself (or the kids and the cat) totally freaks me out. I just hear about all the burns that come into the ER on Thanksgiving from deep frying turkeys and it’s scary. I’m guessing it’s from people not being safe though. 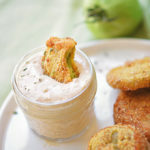 By following the right techniques deep frying your okra can be done safely and without too much of a mess. First be safe. Keep kids and pets away from your stovetop. 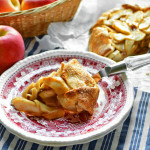 Have a sturdy pair of oven mitts at the ready and wear an apron. If you don’t over-fill your pot a burn or a grease fire is unlikely. It’s important to note that if a grease fire should occur to NEVER USE WATER. Instead, turn off the burner and cover the flame with a pot lid to cut off the oxygen supply. If that doesn’t work you can sprinkle a generous amount of baking soda over the flame. Every kitchen should have a box of baking soda just in case. Bread the okra (see the recipe at the end of this blog post for exact measurements). Add 3-6 C of vegetable oil to a sauce pan so that it’s enough to fully submerge your okra. If you under-fill the pot your okra won’t cook evenly. 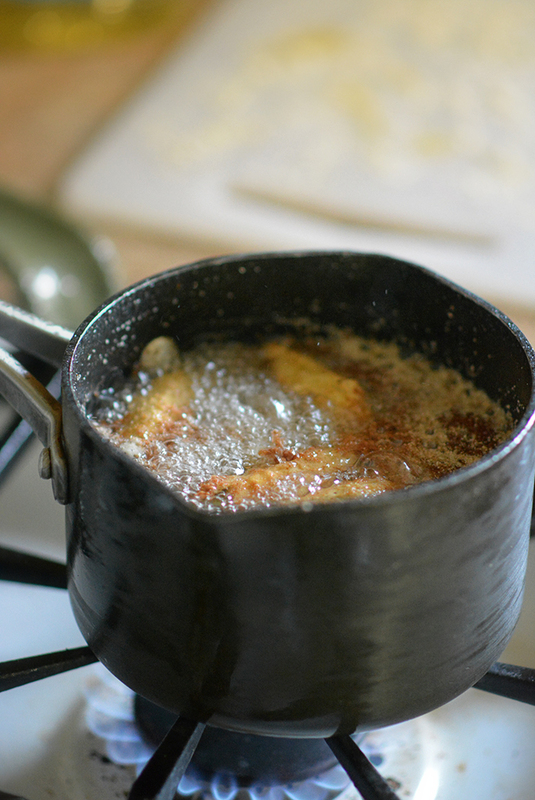 If you over-fill your pot the oil will splatter too much during cooking, so don’t fill it more than halfway. Note that if you are using a larger pan you will need more oil. Note that I filled this pot to just under halfway with oil. I wouldn’t want to fill it any higher. Once the oil starts bubbling it takes up a lot of extra space in the pot. Heat the oil to a temperature of 365ºF. Keep track of your temperature by using a thermometer. A frying or a candy thermometer that can clip to the side of the pot works well for this task. Adjust your burner up and down throughout the cooking process as to maintain a temperature of 365-375ºF. Working in batches, add the breaded okra to the heated oil. Cook for 1 1/2-2 1/2 minutes, until the okra is golden brown on all sides. Use a ladle or tongs and place the fried okra onto to a paper towel to drain off excess oil. 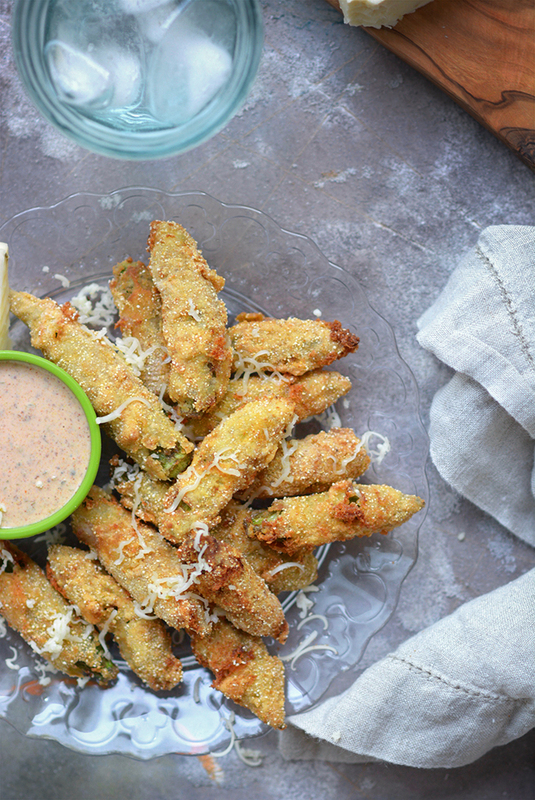 The end result is crunchy, zesty, and cheesy southern okra. 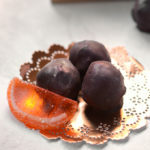 They’re so tasty that it might be difficult to share! When you’re done stuffing your face with fried okra you’ll have to deal with the obvious problem of disposing of your used oil. Before you do anything with it make sure that it is cooled to room temperature so that you don’t burn yourself. Some people will pour their vegetable oil down the drain. This probably won’t clog your sink, but it may on a cold day. Keep in mind that the freezing point of vegetable oil is 14ºF, so as you start to approach that temperature it will become thick and then freeze. The ideal way to dispose vegetable oil is to pour it into a water tight container that you pull from your recycling bin and then to throw it in the trash. 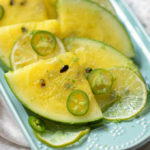 Kick up your next party with this spicy, late summer treat that's gushing with delicious cajun flavor. Wash the okra and dry it with a towel. Trim the tips of the stems so that they look pretty but don’t cut off the stems. 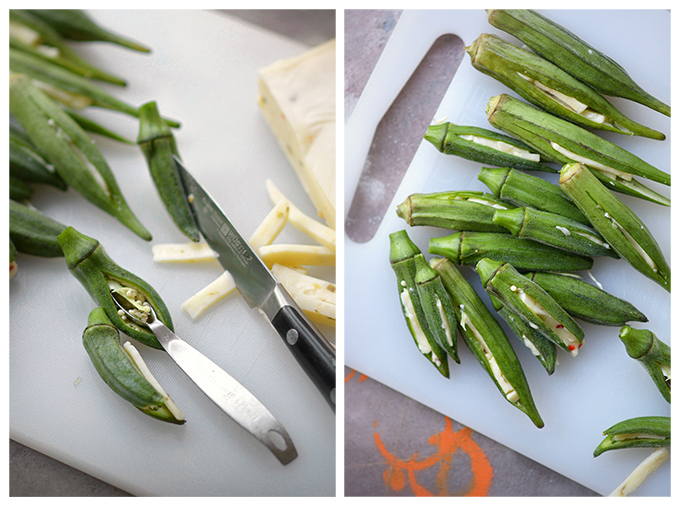 Cut a slit along the length of the okra pieces from the base of the stems to about ¼ inch from the end of the fruit. Next scoop out most of the seeds with a small spoon to create a space for the pepper jack cheese. A ⅛ tsp works well for this task. Once all the okra is prepped, cut the cheese into large matchsticks and then stuff it into each piece of okra until the okra feels stuffed and firm, but isn’t overflowing. To bread the okra you will be dipping it four times, so you will be preparing 4 bowls. In one bowl mix together 1 C of flour, the cajun seasoning, salt, and black pepper. In the next bowl combine 1 C of flour and the corn meal. In another container pour the buttermilk, and in the final container beat 4 eggs. For the buttermilk and the eggs I like using small canning jars because they make it easy to dip the okra into. Bread the okra by holding it by the stem. First, dip it into the buttermilk. Second, roll it in the flour mixture. Third, dip it into the beaten eggs. Fourth, roll it into the cornmeal mixture. 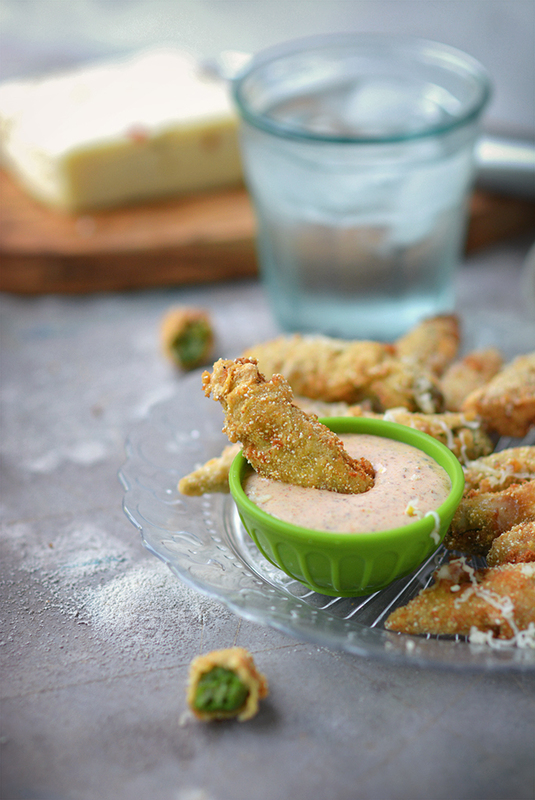 As each piece of okra is breaded, place it on a cutting board until you are ready to fry. In a deep fryer or sauce pan, heat vegetable oil to a temperature of 365ºF. You will need 3 to 6 cups depending on the size of the container you’re heating it in. You will need enough oil to completely submerge your okra, but don't fill your pot more than half full to prevent splattering. For a deep fryer follow the manufacturer's instructions. If you are heating your oil in a sauce pan you will have to watch your temperature with a thermometer (a frying or candy thermometer works well) and make adjustments to your burner as needed. Working in batches, add the breaded okra to the heated oil and cook for 1½ to 2½ minutes until it is golden. Use a ladle or tongs and place the fried okra onto a paper towel. Continue to do this until all of the okra is cooked. Serve immediately. 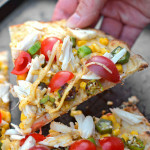 Garnish with any remaining pepper jack cheese that has been finely shredded. I highly recommend serving this with my recipe for Homemade Cajun Remoulade Sauce. 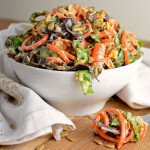 See the link below the recipe card to get the Remoulade recipe. 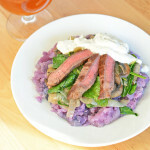 Follow this link to get my recipe for Homemade Cajun Remoulade Sauce.